Momentous Corp — It’s the Internet stupid! All questions regarding Momentous are answered in two words – The Internet. We don’t get cute. We don’t stray. We stay on course. There is no pretense in our profile, history and principles. We’re simply a corporation solely dedicated to the Internet … and its infinite possibilities. WORK FOR US | bring it! We're not talking about past success, fancy letters after your name, or your professional connections. We want you to bring unstoppable drive, mind-spinning ideas and crazy skill. You want to do more than complete a job or enhance a career. You want to dominate your field. 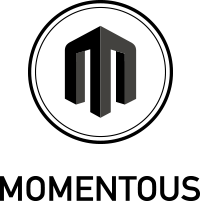 Momentous makes it happen. You just need to bring it. Keep checking in for more great job opportunites. We’re passionate about the internet. And we’re always willing to discuss the unfathomable possibilities it promises. And if you need to get microscopic, you can always visit our specific business sites to learn more. Whether you're looking for an expert in the domain name industry to comment on a story or think you'd like to partner with one, our door is always open. © 2015 Momentous Inc. All rights reserved.